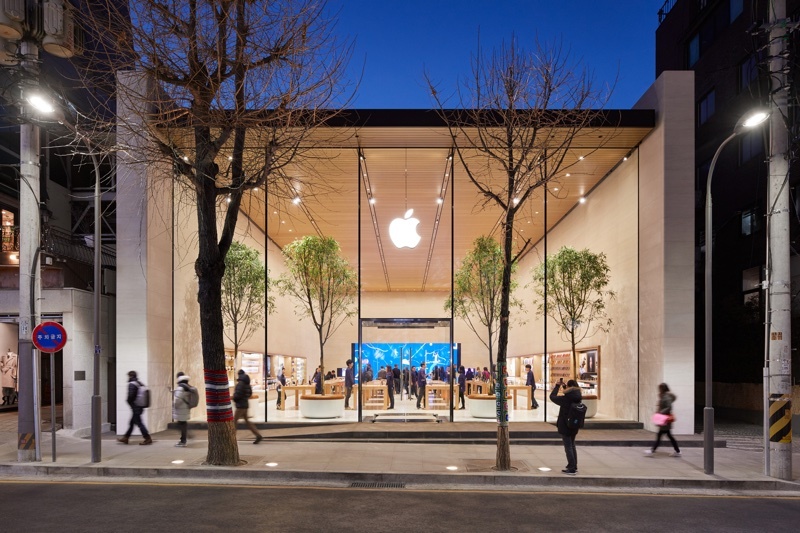 Apple's first store in South Korea is set to open on Saturday, January 27, and ahead of the store's official launch date, Apple has shared photos showing off the new location. Apple Garosugil is located in the upscale Garosugil shopping area in the heart of the well-known Gangnam District in Seoul. The store, which is south of the Han River, features a 25-foot glass facade with in-store trees that are designed to blur the lines between the store itself and the tree-lined street where it's located. "We're thrilled to open a new home for our customers in the vibrant city of Seoul and we look forward to continuing to grow in Korea," said Angela Ahrendts, Apple's senior vice president of Retail. "Our stores are gathering places for the community where everyone is welcome to connect, learn and create." Like all Apple Stores, Apple Garosugil will offer dozens of free daily workshops to tech participants photography, music, art, design, coding, and more. Each session is led by a Creative Pro and hosted in "the Forum," an area of the Apple Store with a dynamic 6K video wall, which is a layout offered in many of the company's retail stores around the world. 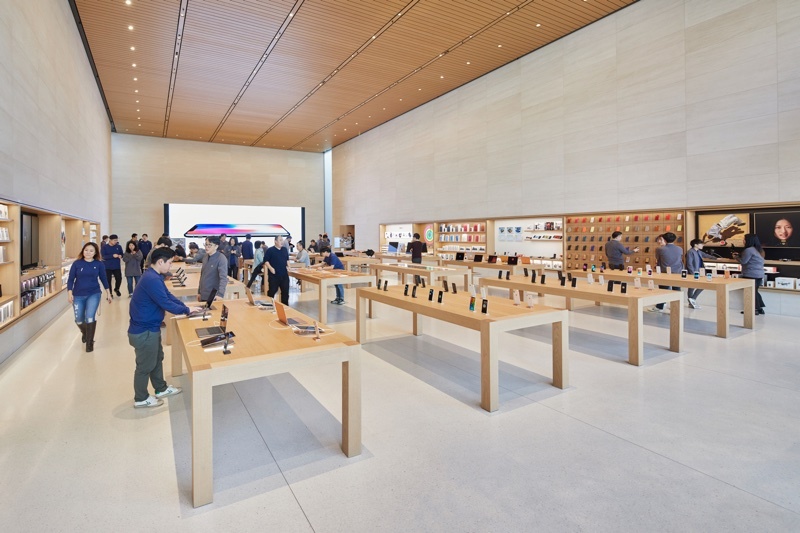 Apple says the store will include its full line of products along with a curated collection of accessories located in the "Avenues," aka dedicated display areas where customers can interact with products. Garosugil is likely to be Apple's 500th retail store, so long as no additional stores open between now and Saturday. Apple currently has 499 retail stores around the world, not counting Apple Watch boutiques and factoring in the September closure of the Simi Valley store. Apple first announced plans to open its first store in South Korea a year ago, and the location has been under development since then. Apple Garosugil will open up at 10:00 a.m. local time, and Apple is already accepting Genius Bar appointments and Today at Apple signups. Looks great with the trees both inside and outside. I live in the opposite side of the country, but I'll be checking this place out on the opening day. This should be interesting... When I used to live in Seoul a few years ago, one of my acquaintances had a shop in Garosugil, quite close to where Apple Garosugil is located, so it's a familiar walk for me. The streets are still narrow - only the shops themselves have changed somewhat. I'm not sure it'll be able to handle an influx of visitors well, but we'll see. Thanks. Interesting. But what has happened to the building Apple was occupying exactly? Has the Apple style facade been removed? Did the interior Apple style lighting system get removed? Or did Apple just remove their logo and leave the rest? The lot 535 was where the Apple Store was. (Just across from the Victoria's Secret) As of yet, it doesn't look like anyone has moved in per the site. Perhaps if you have access to Google Earth or something akin to that, you could find a perspective that lets you look at it yourself.